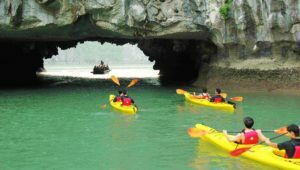 The South West Vietnam attracts crowds of tourists to visit many beautiful green fields, rivers and canals. 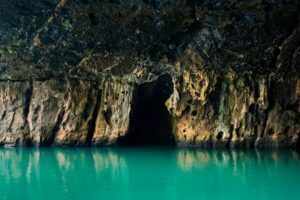 Below is some famous tourist destinations of the South West Vietnam that tourists should not missed. Cai Rang is one of the famous river markets in the South West Vietnam and Cai Rang market is a famous place in the Mekong Delta( Read more ). The market specializes of fruits and agricultural products. In the morning, there are hundreds of large boat stays close together. People will hang the selling product on the pole in the boat so everyone will know what they selling without asking. Cai Rang floating market has become the most attractive tourist place of Can Tho. Con Phung Resort is a floating island belonging to Tan Thanh Commune, Chau Thanh District, Ben Tre Province. Here, visitors will have the opportunity to participate in the life of the local people such as canoeing in canals, horse-drawn carriages to visit orchards or traditional villages, enjoy Honey tea, or listen to folk music,… Besides all of that, visitors can also participate in many interesting games. When visiting Can Tho, visitors should not miss My Khanh tourist resort – one of the attractive ecotourism. Come to this place, tourists will have a chance to visit the traditional countryside house, walk in the shade, enjoy the cool breeze and hundreds of fruits or play many games. Come to Tan Quy, in addition to enjoying many delicious fruits, visitors will also be able to catch small fish under the ditch and enjoy some delicious dishes made from those fish. 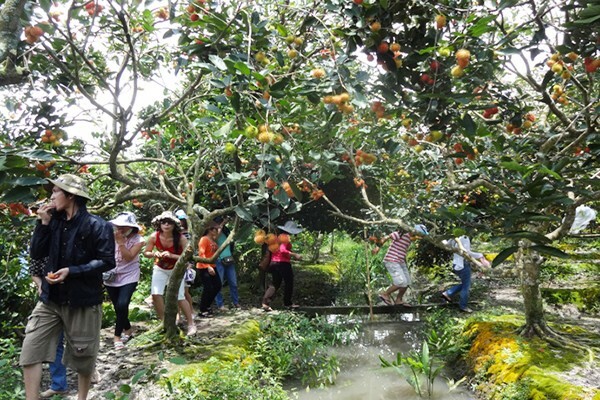 Covering an area of ​​over 7,600 hectares, Tam Binh fruit garden (Vinh Long) is famous for its fruit trees such as citrus, mango, durian, mangosteen and dragon fruit with sweet taste. Beside fruit garden, tourists can also visit Cai Ngang, Ky Son Pagoda, Phuoc Son Pagoda … and traditional villages. Thoi Son islet located in the Tien River, in Chau Thanh district, Tien Giang province. Thoi Son is known as the land of delicious fruits. 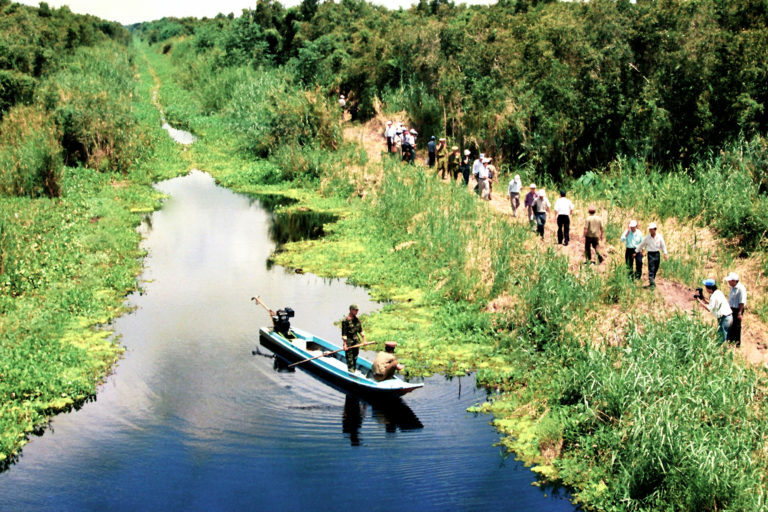 Visiting to Thoi Son, tourists will be able to canoeing the boat down the zigzag canal between two rows of coconut. In addition, visitors can also take a stroll along the winding pathways, cross the orchards, or sit in the garden drinking honey tea and listening to music. At night, Thoi Son is romantic with moon, cool wind, tourists can sit lightly on the river boat, watching the moon and chat with friends. Every year from August to October of lunar year, Tra Su Melaleuca forest (An Giang) re-dressed in green shirt with charming beauty. The red dirt road leading to the Melaleuca forest which is over 800ha. The two sides of the road are palm trees and followed by green fields. A small boat rowing into Tra Su forest will wave green carpet on the water which is actually some kind of leopard. At the reach of hand is duckweed, sometimes dotted with bright yellow flowers, lotus flowers, though simple but impressive. Sometime there are gentle breezes, fresh air and the sound of wild birds from the jungle. 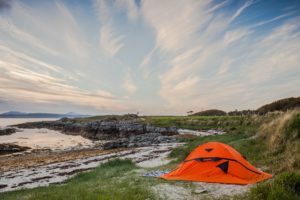 This place has become a popular tourist destination of the South West that visitors can not ignore on their journey. U Minh Thuong National Park (Kien Giang province) is famous for its red water color in canals and ponds. When the leaves fall and decay, they are absorbed into the water, that is why the water here is red. Vam Ho bird sanctuary is located in My Hoa and Tan Xuan Communes, Ba Tri District, Ben Tre Province. Vam Ho bird sanctuary is salt water area where many wild species grow. This place is home to many kinds of birds including 84 species of 35 families, 12 sets, most of which are storks and cauldrons. Vi Thuy forest located in Hau Giang province, has a total area of about 200 ha, in which the area of melaleuca forest is 35ha. The province has suitable land conditions for freshwater aquaculture, fruit trees, ornamental plants, wildlife sanctuaries, guesthouses and culinary villages. Besides, there are cultural exhibitions of Kinh, Chinese, Khmer culture.